Philippines President Rodrigo Duterte, left, shakes hands with U.S. President Donald Trump during an ASEAN Summit, in Manila, Philippines, Nov. 13, 2017. U.S. President Donald Trump repeatedly praised Philippine President Rodrigo Duterte on Monday, virtually ignoring discussion of Duterte's human rights record in carrying out thousands of extrajudicial killings in his war against drug suspects. White House spokeswoman Sarah Huckabee Sanders said human rights “briefly came up in the context of the Philippines’ fight against illegal drugs” as Trump met for 40 minutes with Duterte in Manila. Rights groups had called on Trump to end his five-nation Asian trip with a statement condemning Duterte’s killing of drug suspects in a far-reaching campaign. Human Rights Watch says that since mid-2016 security forces and “unidentified gunmen” have killed at least 7,000 suspected drug users and dealers, with 3,116 of the killings carried out by police. By comparison, the death toll in a year under Duterte is higher than the number killed while dictator Ferdinand Marcos was in power between 1972 and 1981. Trump praised Duterte for his organization of summits in Manila, saying he handled them "beautifully. I've really enjoyed being here." 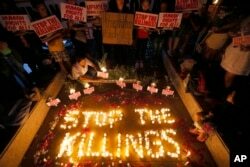 FILE - Human rights activists light candles for the victims of extrajudicial killings around the country in the wake of the "War on Drugs" campaign waged by Philippine President Rodrigo Duterte, in suburban Quezon city northeast of Manila, Philippines, Aug. 15, 2016. Before Trump was elected, Duterte attacked former U.S. president Barack Obama as a “son of a whore” last year after the Obama administration criticized Duterte’s human rights record.